Objectives To explore the functions of RUNX3 single nucleotide polymorphisms (SNPs) associated with ankylosing spondylitis (AS). Methods Individual SNP associations were evaluated in 4230 UK cases. Their effects on transcription factor (TF) binding, transcription regulation, chromatin modifications, gene expression and gene interactions were tested by database interrogation, luciferase reporter assays, electrophoretic mobility gel shifts, chromatin immunoprecipitation and real-time PCR. Results We confirmed the independent association of AS with rs4265380, which was robust (P=4.7×10−6) to conditioning on another nearby AS-associated RUNX3 SNP (rs4648889). A RUNX3 haplotype incorporating both SNPs was strongly associated with AS (OR 6.2; 95% CI 3.1 to 13.2, P=1.4×10−8). In a large UK cohort, rs4265380 is associated with leucocyte counts (including monocytes). RUNX3 expression is lower in AS peripheral blood mononuclear cells than healthy controls (P<0.002), independent of rs4265380 genotype. Enhancer function for this RUNX3 region was suggested by increased luciferase activity (approximately tenfold; P=0.005) for reporter constructs containing rs4265380. In monocytes, there was differential allelic binding of nuclear protein extracts to a 50 bp DNA probe containing rs4265380 that was strongly augmented by lipopolysaccharide activation. TF binding also included the histone modifier p300. There was enrichment for histone modifications associated with active enhancer elements (H3K27Ac and H3K79Me2) that may be allele dependent. Hi-C database interrogation showed chromosome interactions of RUNX3 bait with the nearby RP4-799D16.1 lincRNA. Conclusions The association of AS with this RUNX3 regulatory region involves at least two SNPs apparently operating in different cell types. Monocytes may be potential therapeutic targets in AS. From genome-wide association studies, it appears that more than 100 genes are involved in susceptibility to ankylosing spondylitis (AS). One of these is RUNX3, a transcription factor involved in the maturation of several immune cell types. Several single nucleotide polymorphisms (SNPs) upstream the promoter of RUNX3, which are strongly associated with AS lie in a putative genomic regulatory region. One of these SNPs, rs4648889, appears to be operative particularly in CD8+ T cells. We report potential functional effects from a second independently associated SNP in this RUNX3 region (rs4265380) that may be restricted to monocytes rather than T cells. The independent associations of AS with these two SNPS and the likelihood that they have functional effects in two different cell types suggest that both CD8+ T cells and monocytes could be therapeutic targets in AS. Understanding the functions of this RUNX3 could provide new insights into the pathogenesis of AS. By investigating the AS-associated mechanisms controlling RUNX3 transcription and the regulatory effects of RUNX3 itself on downstream gene expression, we expect to identify pathways that include credible therapeutic targets for future drug development. Here, we present evidence for the complexity of both the molecular and cellular associations of RUNX3 with AS. Having previously established the strong association of AS with rs4648889 in this region (P=1.3×10−14),11 we now confirm the presence of a second independent association with a second SNP—rs4265380. We characterise some of the functional effects of this SNP and conclude that these two adjacent but independent signals probably exert their effects in different cell types. Historical genotype data from the UK subset of cases included in the AS Immunochip study (n=4230) and ethnically matched healthy controls (n=9200) were used in the association studies.1 Where necessary for cases used in the functional studies, DNA was extracted using the Qiagen AllPrep DNA/RNA Mini Kit (Qiagen Ltd, Manchester, UK) and genotyped for rs4265380 using TaqMan SNP assay (Life Technologies, Paisley, UK). Following written informed consent (COREC 06/Q1606/139 and OXREC B 07/Q1605/35), venous blood samples were obtained from 17 cases fulfilling either the modified New York criteria for AS or the Assessment in SpondyloArthritis international Society (ASAS) imaging criteria for axial spondyloarthropathy.20 21 Their average age was 45 years (range 24–64); medications included non-steroidal anti-inflammatory drugs (n=13) and sulfasalazine (n=2); all cases were biologic therapy naive. Disease activity assessed by the Bath AS Disease Activity Index (BASDAI)22 and C-reactive protein (CRP) showed substantial variation (mean BASDAI=3.2, range 1.2–6.6; mean CRP=6.1 mg/L, range 0.2–19). Cloning of the 250 bp sequence flanking rs4265380 was performed as previously described.11 The constructs were efficiently transfected into human embryonic kidney HEK-293T cell line using Lipofectin (Life Technologies) according to manufacturer’s instructions. Transfection was carried out for 48 hours. The Dual-Luciferase assay reporter system (Promega, Madison, USA) was used to evaluate luciferase activity. Firefly luciferase activity was normalised relative to Renilla luciferase activity for each transfection and calculated as fold increase over pGL4.23[luc2/minP]. CD14+ monocytes were isolated from peripheral blood mononuclear cells (PBMCs) using a monocyte isolation kit (Miltenyi, Bisley, Surrey, UK). Monocytes were resuspended at 1×106/mL in prewarmed Roswell Park Memorial Institute medium supplemented with 10% fetal bovine serum, penicillin/streptomycin and L-glutamine and rested overnight. Monocytes (4×105) were stimulated for 24 hours with or without ultrapure lipopolysaccharide (LPS 20 ng/mL; Invivogen, San Diego, USA) before harvesting for experiments. A 50-bp DNA probe including rs4265380 was incubated with nuclear extracts obtained either from primary CD14+ monocytes stimulated with LPS for 24 hours or a monocyte cell line from histiocytic lymphoma (U937) stimulated with phorbol-12-myristate-13-acetate (PMA). Nuclear extracts from monocytes and U937 cells were prepared using the Thermo Scientific NE-PER Nuclear and Cytoplasmic Extraction kit (Thermo Scientific, Waltham, USA). EMSA was performed using LightShift Chemiluminescent EMSA Kit (Thermo Scientific) with no modifications. Single-stranded biotinylated oligonucleotides (prepared with biotin 3′ end DNA labelling kit) were mixed and annealed at room temperature for 1 hour. Five micrograms of nuclear extract and 0.5 ng biotin labelled double-stranded oligonucleotides (50 bp fragment; Eurofins, Wolverhampton, UK) were used in each experiment. Unlabelled probes in 100-fold excess were used as competitor. (Underlined base highlights the position of rs4265380). ChIP was performed using the Low Cell# ChIP kit (catalogue ID C01010072, Diagenode, Liege, Belgium) as previously described.11 For each ChIP, 3×105 monocytes, either unstimulated or LPS stimulated for 24 hours, were used. DNA was isolated with the Low Cell# ChIP kit (Diagenode) and qPCR performed on immune complex-associated DNA using allele-specific primers for rs4265380 (WT sense primer: 5′-TGACGCAATTTGGGCTAC-3′; AS-risk sense primer: 5′-TGACGCAATTTGGGCTAT-3′; common antisense primer: 5′-CCAGCTGTGTCATTCTCCAA-3′), detected with SYBR Green (Qiagen Ltd) on ABI ViiA 7 PCR device (Applied Biosystems, Paisley, UK). Relative occupancy was calculated as a ratio of specific signal over background: % input (specific loci)/% input (background loci). The following ChIP grade antibodies were used: p300 ((C-20), SC585X, Santa Cruz Biotechnology, Dallas, USA), H3K4Me1 (Diagenode, Mab-150–050), H3K79Me2 (Diagenode, C15410051), H3K27Ac (Diagenode, Mab-184–050) and IgG (Diagenode, K02041008). RNA was isolated with TRIzol (Invitrogen, Paisley, UK) and reverse transcribed with Superscript III (Invitrogen) to synthesise cDNA as previously described.11 The specific primers were: RUNX3 sense (s): 5′-ACTCAG CAC CAC AAG CCA CT-3′; RUNX3 antisense (as): 5′-GTC GGA GAA TGG GTT CAG TT-3′; RP4-799D16.1 s: 5′-CAG ATG GCA TTT GGG ATC CA-3′’; RP4-799D16.1 as: 5′-TTC CTG TGT TGG CAT CTG AC-3′. PCRs were performed in triplicate and the 2−ΔCt method was used to calculate the expression of each gene. All values were normalised to β-actin (ID Assay qHsaCED0036269, Bio-Rad Laboratories, UK). miRNA quantitative real-time RT-PCR miRNeasy Mini Kit (Qiagen Ltd) was used to isolate total RNA, according to the manufacturer’s instructions. Ten nanograms of RNA was reverse transcribed and quantified by TaqMan real-time PCR using the TaqMan microRNA Assay (hsa-miR-4425, assay ID: 462954_mat, Applied Biosystems). RNU6 was used as endogenous control (U6 snRNA, assay ID: 001973). For detection, we used a vii7 PCR machine (Applied Biosystems). Association analysis was performed using the logistic regression function in PLINK,26 V.1.07, accounting for population structure with 10 principal components as covariates in the regression analysis and conditioning on the RUNX3 SNP rs4648889.11 Haplotypes were inferred by phasing using the SHAPEIT tool27 and all SNPs genotyped in the locus (chr1: 23038732–27660734). Haplotype counts in cases and controls were compared using the χ2 test and measured relative to the most common haplotype found in the control samples. One-way analysis of variance and two-tailed Student’s t-test were used to determine statistical significance using the GraphPad Prism software (V.7.03) package. The region upstream of RUNX3 contains potentially important regulatory sequences. However, the strongest association with AS in this region is with rs6600247 (P=4.23×10−9) that does not overlap with obvious functionally active sites. We therefore investigated SNPs in strong LD with rs6600247 that lie in a region associated with open chromatin for evidence of regulatory activity; these include rs4648889 (unconditional analysis P=9.5×10−9, figure 1A) that is functionally active in CD8+ T cells. 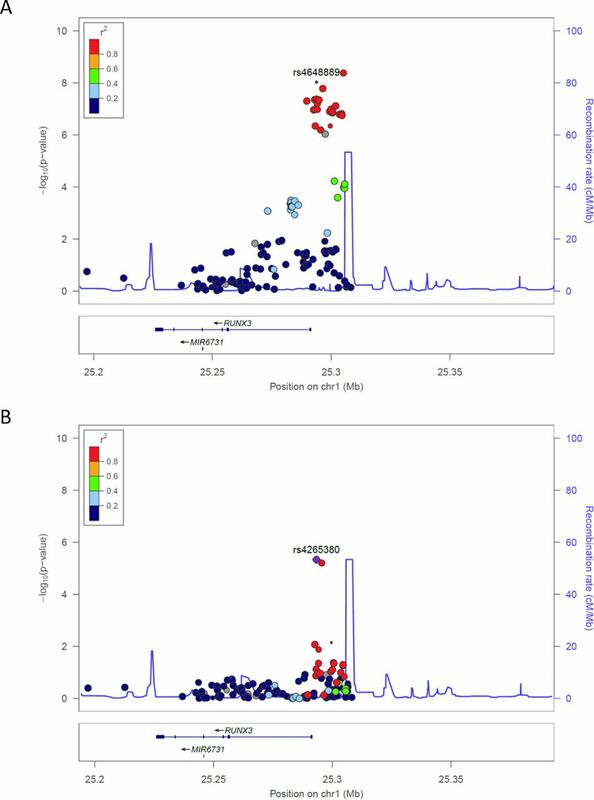 Of the 22 RUNX3 SNPs previously associated with AS in the IGAS Immunochip study at P≤5×10−7, rs4265380 (P=4.58×10−7) was the most strongly associated (with the ‘C’ allele) after conditioning on rs6600247 (lead IGAS SNP) or rs4648889 (figure 1B). Interrogation of the publicly available ENCODE and Roadmap databases (figure 2) shows that rs4265380 is close to potential regulatory sequences active in CD14+ monocytes that include: (1) DNase I hypersensitivity sites; (2) H3K4Me1, H3K27Ac and H3K79Me2 histone modifications that are associated with regulatory regions and replication initiation sites and (3) ChIP sequencing peaks for TF binding, particularly p300 (a transcriptional activator and histone reader). This region, therefore, appears to contain a potential regulatory element upstream of RUNX3 specifically active in monocytes, in which the C allele at rs4265380 increases the risk of AS. Ankylosing spondylitis susceptibility associations with RUNX3 in UK cohort. (A) Unconditional association showing rs4648889 primary signal. (B) The plot shows association over RUNX3 after conditioning for SNP rs4648889, retaining positive association for rs4265380. 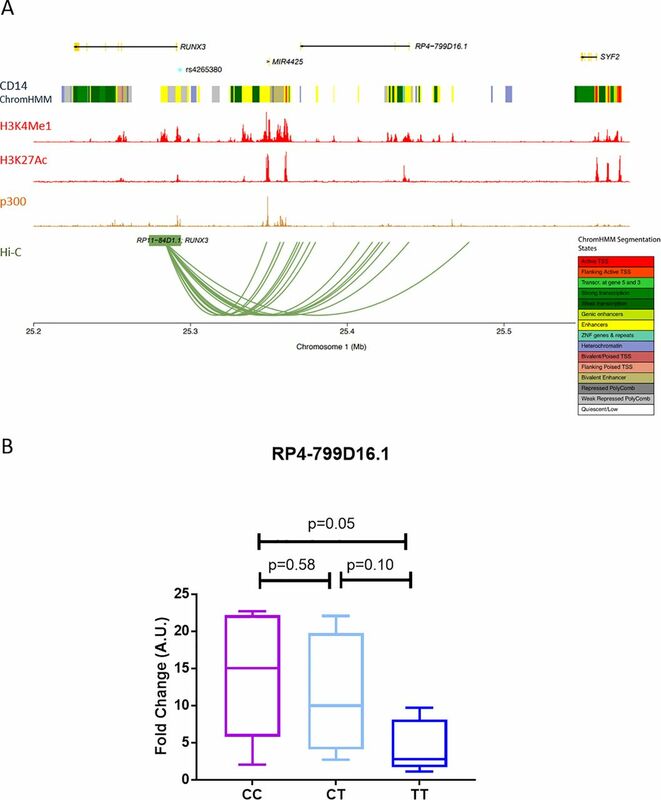 Genetic mapping and epigenetic landscape of RUNX3 locus overlapping rs4265380. The region including rs4265380 (GRCh37/hg19 human genome build; chr1: 25292650–25294000) is shown comprehensive of single nucleotide polymorphism (SNP) location, RUNX3 gene position and chromatin state. DNase I hypersensitivity and histone modification chromatin immunoprecipitation sequencing (ChIP-seq) data (Roadmap EpiGenome Browser V.1.19) including H3K4Me1, H3K27Ac and H3K79Me2 for CD14+ monocytes are shown. ChIP-seq for p300 transcription factor is shown for the available lymphoblastoid cell line GM12878.23 24 The position of rs4648889 SNP and the location of the 250-bp construct used in luciferase assay are also shown. We included the two SNPs—rs4265380 and rs4648889—that were both independently associated with AS in a haplotype analysis (table 1). Both SNPs were formally genotyped rather than imputed. The CA haplotype was associated with a particularly high risk for AS (OR 6.2; 95% CI 3.1 to 13.2, P=1.4×10−8) compared with the most common CG haplotype. The OR of CA relative to TA is 5.35 (P=2.7×10−7). We interrogated the Roslin Gene Atlas (http://geneatlas.roslin.ed.ac.uk/), a public database including more than 400 000 individuals (from the UK Biobank), to investigate a plausible role for rs4265380 associations with leucocyte cell counts. The results for rs4265380 showed a significant reduction in monocyte (P=0.006), neutrophil (P=6.4×10−7) and eosinophil (P=8.3×10−7) counts associated with the C allele. No association was apparent for lymphocyte counts (P=0.2), consistent with our hypothesis that rs4265380 is acting specifically in monocytes. The historical data on RUNX3 mRNA in PBMCs measured by RNA-seq showed significantly reduced expression (P<0.002) in AS cases compared with healthy controls. When these results were stratified on rs4265380, there was no apparent influence of this SNP on expression levels (online Supplementary figure 1A). We performed luciferase reporter assays to evaluate possible enhancer activity of the region spanning rs4265380. Reporter constructs including the 250-bp DNA sequence spanning rs4265380 increased luciferase activity approximately 10-fold (P=0.0005) compared with the minimal promoter alone, which was consistent with its having enhancer activity. Since there was no apparent difference between constructs containing either the rs4265380 C (risk) or T (protective) allele in this system (figure 3), we chose to investigate possible allelic differences by other methods. 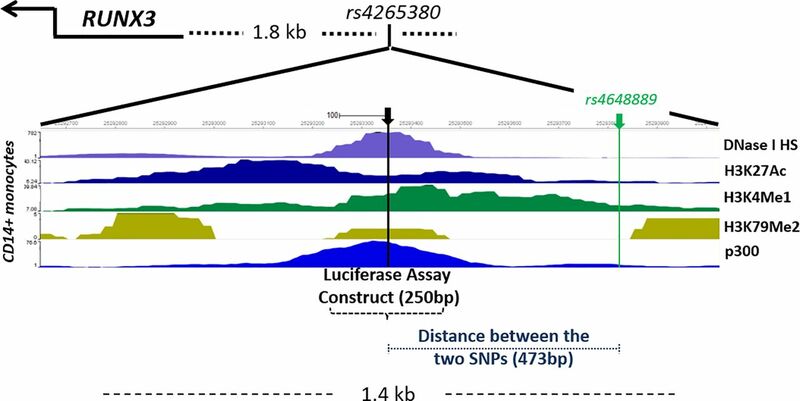 The genomic region spanning rs4265380 shows enhancer activity. 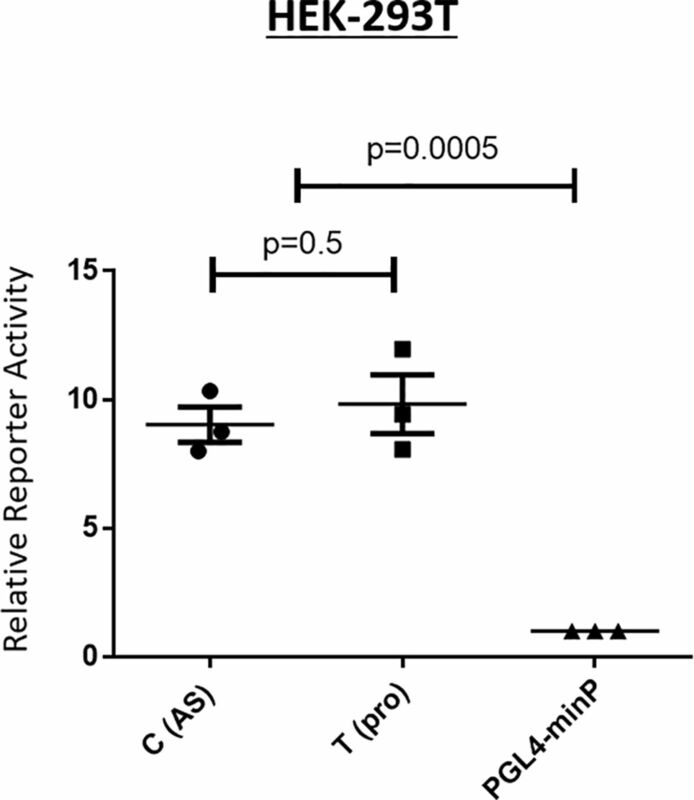 The reporter activity of rs4265380 compared with minimal promoter construct (minP) and normalised to Renilla internal control was measured by luciferase assays on HEK293T (n=3). The values of relative luciferase activity are expressed as mean±SEM. (P=0.0005, Student’s t-test). AS, ankylosing spondylitis. We performed EMSAs to evaluate the impact of the rs4264380 polymorphism on DNA/TF binding. A major protein/DNA complex was seen with both monocyte (figure 4A arrowed) and U937 nuclear extracts (figure 4B arrowed). Little difference in binding was seen between the two rs4265380 alleles in unstimulated cells (online Supplementary figure 2A arrowed), but when stimulated monocyte and U937 cell nuclear extracts were used, a much stronger band was seen for the T (protective) allele. Successful competition with 100-fold excess of unlabelled probe confirmed the specificity of these experiments (figure 4A and B and online Supplementary figure 2A). Quantification of the DNA/protein complex is shown in figure 4C (n=6 experiments, monocytes+LPS: P=0.02; U937+PMA: P=0.03). Preincubation with p300 antibody also greatly reduced the binding of nuclear extracts from both stimulated monocyte and U937 cells, suggesting that p300 is included in the complex (figure 4A and B). We conducted ChIP-qPCR (n=3) on LPS-stimulated CD14+ monocytes to assess the enrichment of p300, which was found to be similar for both alleles (figure 4D). Additional experiments performed with CD8+ T cells and stimulated Jurkat nuclear extracts (online Supplementary figure 2A) showed no differential binding thereby confirming that the effect of rs4265380 appears to be restricted to a monocyte-like milieu. rs4265380 alters protein/DNA complex formation with the involvement of p300. (A and B) Representative EMSA showing differential nuclear extract binding (complex as indicated by arrow) after addition of stimulated primary monocytes (A) and U937 cells (B) (lanes 2 and 6). The 100-fold excess of unlabelled probes has been used as competitor (lanes 3 and 7). p300 involvement was assessed by adding p300 antibody (lanes 4 and 8). Arrows indicate the presence of DNA/nuclear extract complex. Numbers below the band represent the pixel intensity measured with Image J. (C) Quantification of the DNA/protein complex of six independent EMSAs performed on both stimulated monocytes and U937 cells (P=0.019 and P=0.031, respectively, Student’s t-test). (D) Relative enrichment of p300 was assessed with chromatin immunoprecipitation experiments (n=3) on rs4265380 CT heterozygote CD14+ monocytes (after 24 hours stimulation with LPS). AS, ankylosing spondylitis; EMSA, electrophoretic mobility shift assay; LPS, lipopolysaccharide; PMA, phorbol-12-myristate-13-acetate. The RUNX3 locus lies close to two non-coding RNAs (miR-4425 and RP4-799D16.1 lincRNA) and also the SYF2 locus, which is 240 kb upstream of the RUNX3 promoter. By interrogating the Capture Hi-C plotter database (https://www.chicp.org/chicp),25 we observed interactions between RUNX3 bait (overlapping rs4265380) and other regions of chromosome 1, specifically with RP4-799D16.1 and miR4425, but not with the more distant SYF2 locus (figure 5A). Expression of RP4-799D16.1, a lincRNA with unknown function, showed a significant (P=0.048) increase in LPS-stimulated CD14+ monocytes from AS cases with the CC (AS-risk genotype) compared with the TT genotype (figure 5B). miR-4425 was not detected (data not shown). There was no discernible effect on the expression of SYF2 (data not shown). rs4265380 AS-risk C allele alters enrichment for specific histone marks in stimulated monocytes. rs4265380 interacts with RP4-799D16.1 (A) Hi-C plot showing the interaction of the RUNX3 bait with different regions within chromosome 1 (with score above 5, in CD14+ monocytes). The location of genes, ENCODE CD14+ monocytes chromatin states, ENCODE histone modification and p300 transcription factor chromatin immunoprecipitation sequencing experiments and rs4265380 position are also shown. The plot has been generated through the International Human Epigenome Consortium database (https://www.chicp.org/chicp)18. (B) RP4-799D16.1 transcript was measured in primary CD14+ monocytes from 16 patients with ankylosing spondylitis with rs4265380 different genotypes (CC, CT and TT). P values were determined using two-tailed Student’s t-test. We assessed the enrichment of specific histone marks associated with active chromatin in this region by ChIP-qPCR (n=3) on LPS-stimulated CD14+ monocytes. There was relative enrichment for H3K79Me2 (average ~3.1-fold, P=0.04) and H3K27Ac (average ~4.6-fold, P=0.03) in the presence of the C (risk) allele (online Supplementary figure 3A), while H3K4Me1 was unchanged. No significant allelic difference was seen in unstimulated monocytes (data not shown). Finding mechanistic explanations for the multiple genetic associations of common diseases, such as AS, is challenging. A small minority of such SNP associations alter protein function that have yielded insights with potential therapeutic implications. Thus, the AS association with rs11209026, encoding an R381Q loss of signalling function dimorphism in the cytoplasmic tail of the IL23 receptor, highlights the importance of the IL23/IL17 axis in AS.6 28 This influenced the successful introduction of anti-IL17A biologics for the treatment of AS.29 However, most GWAS ‘hits’ lie in non-coding regions of the genome with little or no immediately obvious functional significance.9 30In a cross-disease analysis, Ellinghaus et al identified 113 possible non-HLA-B27 AS associated loci, of which only 13 were exonic.31 Furthermore, of the 39 AS associations in this study, only one key SNP was in an exon.19 It seems likely that at least some of these associated SNPs exert regulatory functions either on individual genes or gene networks but unravelling these relatively subtle effects will be difficult,8 32 and the RUNX3 locus is unlikely to be an exception. Our data suggest that the rs4265380 association with AS is probably explained by operational differences in monocytes rather than CD8+ T cells. First, interrogation of epigenetic databases shows relevant areas of open chromatin, TF binding and enrichment for chromatin markers of active transcription limited to monocytes. Second, the allele-specific effects on TF binding appear to be restricted to nuclear extracts from monocytes (particularly after stimulation with LPS). In the EMSA studies, binding of p300 to rs4265380 was allele specific, but ChIP in heterozygous C/T monocytes from AS cases indicates that p300 actually binds to both rs4265380 alleles in the context of native chromatin. 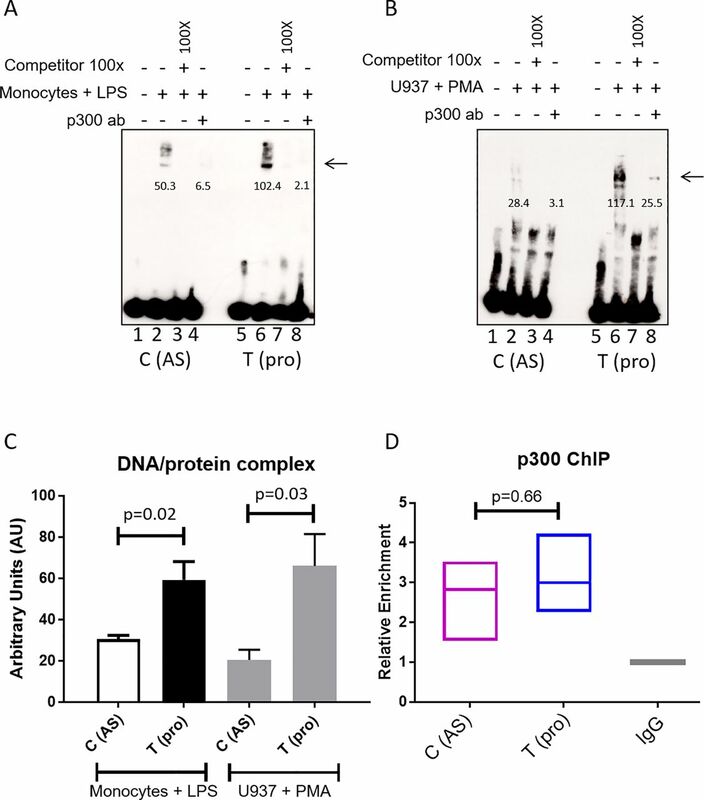 The allelic difference we observed in EMSA is unlikely to be driven by p300 alone but more likely by a multicomponent TF complex recruiting the relevant transcriptional machinery. It is not yet clear whether these findings translate to influences on the expression of nearby genes, including RUNX3. The complexity of the RUNX3 associations and their multiple potential physical chromosomal interactions is further highlighted by the possible interaction of RUNX3 bait (including rs4265380) with a neighbouring non-coding RNA (RP4-799D16.1 lincRNA) of unknown function (see Hi-C plot in figure 5). The observation that PBMCs from AS cases appear to have reduced RUNX3 expression may be relevant to the pathogenesis of AS. However, it does not correlate with the RUNX3 genotypes that we have described here. We cannot exclude a disease-specific effect on RUNX3 expression or an effect arising elsewhere in the genome. In contrast, analysis of the UK Biobank data on the Roslin Gene Atlas database showed a significant association of rs4265380 with monocyte, neutrophil and eosinophil counts that might be relevant to an immune-mediated disease like AS. Further evaluation of these observations in well-defined cell types from AS cases seems justified. In summary, we have identified a regulatory region upstream of RUNX3 that could be relevant to the pathogenesis of AS. The association of this region with AS is complex, including at least two neighbouring SNPs. There is some evidence that these have distinct cellular functional profiles, possibly indicative of pathogenic roles for both CD8+ T cells (shown previously) and monocytes in AS. However, substantial further work will be necessary to confirm this. We wish to thank all the study participants who generously donated their DNA to this study. The authors wish to thank Maria Cristina Carena for technical support. Contributors MV, AC, ARR, JE, MAB and BPW conceived and designed the experiments. MV, ARR, JE and AC performed the experiments. MV, AC, ARR, JE, CJC, MAB, PB and BPW analysed the data. MV, AC, ARR, CJC, JCK, MAB, PB and BPW wrote the manuscript. Funding MV was funded by NIHR Oxford Comprehensive Biomedical Research Centre (immunity and inflammation theme A93081) and arthritis research UK (grant 21428). ARR was funded by arthritis research UK (grant 20402). JCK and PB by the European Research Council under the European union’s seventh framework programme (FP7/2007-2013)/ERC grant agreement no. 281824, arthritis research UK (grant 20773) and the NIHR Oxford Comprehensive Biomedical Research Centre. MAB is funded by the National Health and Medical Research Council (Australia) senior principal research fellowship. Additional funding was provided by arthritis research UK (18797, 19536, 20402, 20796), the NIHR Thames Valley Collaborative Research Network and National Ankylosing Spondylitis Society (UK). Ethics approval Central Oxford research ethics committee COREC 06/Q1606/139 and OXREC B 07/Q1605/35). Data sharing statement Access to unpublished raw data relating to this experiments is available on application to the lead author MV.